My class schedule this year involves 2 night classes that start at 6pm. This has really cut in to the time I would usually take to make dinner. It's hard with work and the clubs I'm in because I could be out of my house all day and only have time for a few snacks. This happened last week. I had class, work, meetings, night class (until 8:30) and then a group project meeting. I didn't get home until 10pm and I was hungry and wanted something quick that wouldn't leave me stuffed before bed. 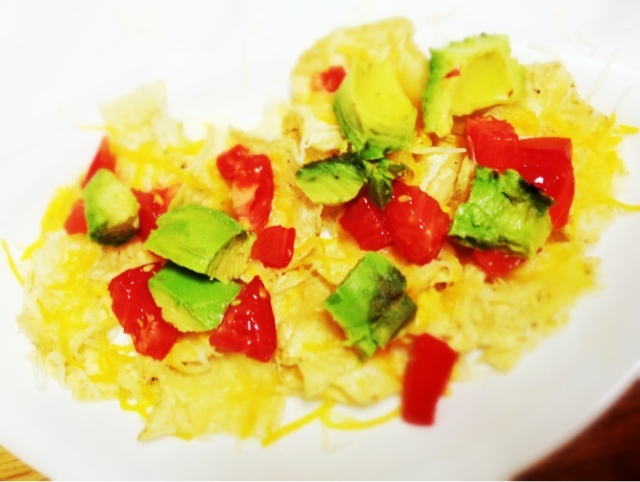 I whipped up these healthy nachos for a simple appetizer that only takes a few seconds. 1. Add a bunch of chips onto a microwaveable plate. Sprinkle with cheese and heat in the microwave for 20-30 seconds. 2. After cheese has melted, sprinkle chips with tomato and avocado. That's it! I love this because its simple but still has a lot of flavor. You save a lot of calories by not loading it with salsa and guacamole, but you still get the nutrients (and flavor) from the tomato and avocado. This would be a great dish for game day!